Gulf Hagas, Somerset County Maine. Photo courtesty of Lee Coursey. When most people think of Maine, they imagine its rugged coastline, rich maritime tradition, and scenic coastal towns. But there is much more to Maine than its beautiful coast. The state’s inland lakes and mountains draw thousands of visitors each year because of their spectacular beauty and recreational opportunities. One of Maine’s best kept secrets is its amazing array of waterfalls. With hundreds of waterfalls to choose from, the top 10 most scenic waterfalls are too subjective to rank and are listed alphabetically. To explore more of Maine’s fabulous waterfalls, the book New England Waterfalls contains excellent information and directions. Angel Falls, a 90-foot waterfall in western Maine’s Franklin County, is one of the most spectacular in the state. The closest town to the waterfall is Byron. From Byron, take Route 17 until you reach a short hiking trail marked by signs. The easy to moderate trail is 0.8 miles in length and leads through the woods to the waterfall. Give yourself 30 minutes to hike to the falls. Angel Falls is fed by Mountain Brook and tumbles 90 miles over a rocky cliff. The waterfall is also known as Angel Wings Falls because its water flow resembles an angel. Visit in June or July for the best hiking conditions and views of the waterfall. Dunn Falls is a beautiful waterfall located near Andover in Oxford County. The upper falls is a 70-foot drop forming a horsetail and fans. The lower falls is a direct plunge, dropping 80 additional feet. There is a moderate difficulty 2 mile loop leading past the falls. This loop includes part of the Appalachian Trail, small pools suitable as swimming holes, and six smaller waterfalls. The trail is accessible from Andover Road and is marked by white blazes. Dunn Falls is best viewed from July through October, when water flow is the greatest. Although Grand Falls is not as tall as other waterfalls in Maine, its immense 120-foot breadth and enormous water flow makes it live up to its name. From The Forks, travel 3 miles north on U.S. Route 201 until you reach Lower Enchanted Road. Turn left on this dirt road and continue for 14 miles. An easy 0.8 mile trail leads to the waterfall, which is 40 feet high. The falls are beautiful year-round, with the heaviest water flow during spring runoff. Swimming is prohibited at this waterfall. Simply enjoy its power, thundering noise, and fresh spray. Gulf Hagas is located in remote Piscataquis County. Access the trail to the waterfall from the parking area in Hay Brook. The trail is an 8.6-mile loop, making it appropriate as a day hike for experienced hikers. To begin, you must cross the West Branch of the Pleasant River, which is approximately 150 feet across and knee deep. Beware of the swifter current and high water levels during the spring. Pick up a map at a gas station or North Maine Woods checkpoint to ensure that you correctly follow the trail. The area features four named waterfalls, dozens of smaller unnamed falls, a gorge called “The Grand Canyon of Maine,” two rivers, and a variety of swimming holes. Enjoy swimming at the base of the falls for a cool, relaxing end to your hike. Houston Brook Falls, located in Somerset County near Pleasant Ridge, is a broad 32-foot waterfall with horsetails and plunges. The Houston Brook cascades over beautiful rocks to form this scenic waterfall. Follow Carry Pond Road southeast from Pleasant Ridge until you see a sign advertising the falls. There is an easy 0.25-mile trail leading to the waterfall. There are several excellent swimming locations at the bottom of the falls. Be careful when scrambling across the rocks, which become very slippery because of the mist. Views of the waterfall are best in the morning from May to October. Katahdin Stream Falls, located in Baxter State Park, is a magnificent cascading waterfall. It is accessible by a moderate 2.4 mile hike. To access the waterfall, enter Baxter State Park at Togue Pond Gate. Continue 7 miles to Katahdin Stream. There is a nearby campground if you want to stay overnight. Autumn is one of the best times to visit this waterfall, because the surrounding woods are awash in color. Moxie Falls is one of the longest single drops in Maine, with a plunge of over 90 feet. The waterfall is fed by Moxie Stream and is located in Moxie Gore Township. To get to the falls, take Route 15 south from Greenville, turning right at Shirley Village and continuing for 12 miles. Turn left onto Moxie Road and follow the signs to the parking area. The trail to Moxie Falls is an easy 0.6-mile hike. To get to the best swimming holes, you must scramble over rocks approximately 100 feet downstream from the waterfall. Screw Auger Falls is located in Grafton Notch State Park. This 30-foot waterfall forms a lovely streaming cascade that makes for breathtaking photographs. Fed by the Bear River, the waterfall is handicap accessible via a 0.1 mile path. The area has picnic tables, ample parking, and bathrooms. Swimming and wading at the base of the falls is permitted. Smalls Falls is located just south of Rangeley and is popular for its beautiful waterfall, excellent swimming holes, and scenic gorge. The gorge features amazing colored walls, with beige, orange, brown, gold, ivory, green, and black rock. Enjoy the bathrooms, fire pits, and picnic tables after your easy 5-minute hike to the waterfall. Smalls Falls has a 54-foot drop with numerous cascades. Step Falls does not offer a dramatic plunge like some of Maine’s other waterfalls, but it gradually descends over 250 feet. Its long chain of cascades and horsetails creates a beautiful, misty water flow. The waterfalls offers dozens of smaller pools with excellent wading and swimming opportunities. To get to Step Falls, take Route 26 northwest from Newry until you see signs for Step Falls Preserve. Follow the moderate 0.6-mile trail, which takes approximately 20 minutes to hike. Step Falls is most scenic from May to October. Little Allagash Falls is found at the northern end of the Allagash Wilderness Waterway. 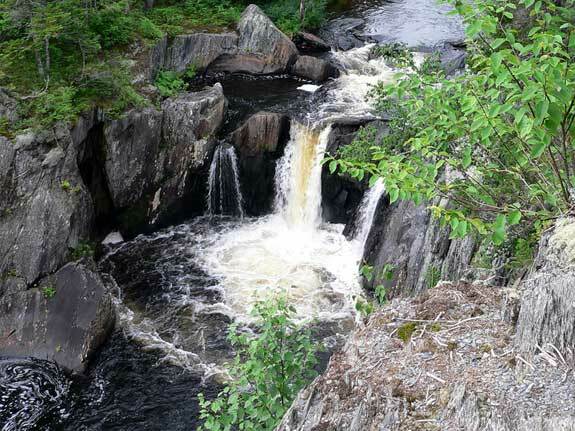 The scenic 30-foot waterfall is a popular rest stop for canoeists paddling the Allagash River. Hay Brook Falls, located in Piscataquis County, is very remote and seldom visited by tourists. This makes it an excellent place to share a picnic or relaxing afternoon on the shore of Hay Brook. There is a short, 0.2-mile trail to reach the 28-foot waterfall. Little Wilson Falls, located near Elliottsville Township in Piscataquis County, features a 25-foot plunge. The waterfall is found just off the side of the road, making it easily accessible by handicapped individuals and young children. Take a dip in the small pools at the base of the waterfall for a fun way to cool off on a warm summer day. Visitors to Carrabassett Valley’s famous Surgaloaf USA ski resort may take a detour to see Poplar Streams Falls. The Poplar Streams waterfall drops 24 feet, while the South Brook waterfall drops 51 feet. A 4.7-mile trail loop connects these waterfalls. Rumford Falls, also known as Pennacook Falls, is a extensive chain of drops of the Androscoggin River. The total drop of the waterfall is 176 feet, making it the largest vertical drop east of Niagara Falls. The waterfall is best viewed during the spring runoff season when its water flow is high.